It’s almost time for the Chinese smartphone giant Xiaomi to release its new flagship mobile. Xiaomi has planned to release Mi MIX 2S on 27th of March in China. And just as the mobile is to be released we have got a sneak peek of it through a new video recently. The video hints at very interesting modifications that the Mi MIX 2S is going to bring about. Let me walk you all through the highlights of the leaked information in this post. The new live images of the smartphone have been doing rounds online that differ from the previous information we have had about the Mi MIX 2S. Previously the leaks pointed at a notch at the top right of the display screen, where the camera was to be placed. But the recent leaks reveal that the Mi MIX 2S will not have any notch on the top. Though having no notch can be a little different but it would look great. The front camera which actually had to be placed at the notch will now be shifted to the bottom bezel where the home button is usually placed. 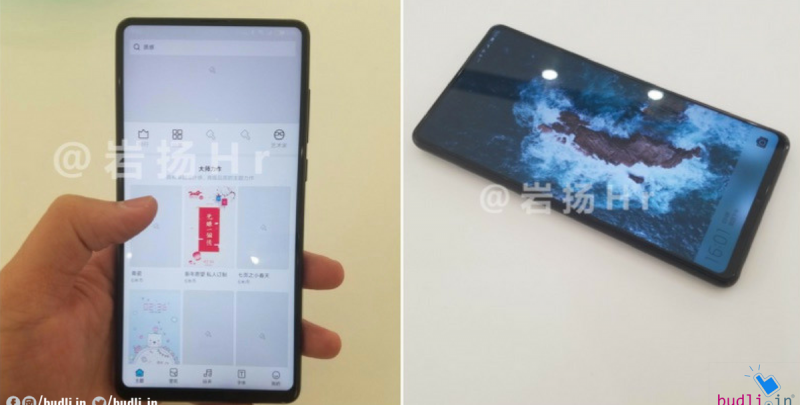 The leaked images of Mi MIX 2S show that the smartphone has a uniform bezel-less design which is not quite familiar with the Xiaomi’s MIX series. As MIUI 9 Beta is present in Mi MIX 2 for navigation using gestures, we can expect the same case in Mi MIX 2S as well. The back of the smartphone was nowhere visible in the leaked images but later XDA Developers confirmed that the Mi MIX 2S will indeed have a dual-camera setup with AI capabilities. It will definitely be interesting to see what the back of the smartphone looks like and the material it is made up of. There are leaks which also suggest that Mi MIX 2S might be the first Xiaomi device to support wireless charging. To contradict the previous leaks, there were few pictures which showed the back of the smartphone to be like the iPhone X’s dual camera setup with a complete ceramic finish. As far as the leaks are concerned we have an assumption of the device but we never know how the end product is going to be. But we can expect a few things like a 6 inch 2160 x 1080p display, Qualcomm Snapdragon 845 chipset with 8GB RAM and 256GB storage. The memory cannot be expanded any further though. The device is expected to have a 3400 mAH Li-ion battery with wireless and fast charging. The phone will run on Android 8 Oreo OS with custom MIUI 9 skin on the top. As of now, there are no Xiaomi Mi A1 devices which run on Android 8 Oreo. There are many flagship phones coming up, so did you ever think of letting your old device do something in order to upgrade to the latest phone? If not, you should give it a thought because here is budli.in for you. Budli is the leading refurbished electronic gadgets site which has a collection of devices from all the brands. You can easily upgrade to the latest device of your choice and also avail discounts. This way you don’t have to worry about spending a lot of money and also have the satisfaction of owning the latest device. Hurry and log on to budli.in.